Annan lifted the points against their closest challengers Elgin City courtesy of a Tommy Muir brace. The Annan striker along with Ross Ferguson was recalled to the Annan starting line up as Peter Murphy was forced to make changes with Chris Johnston and Tony Wallace both unavailable. Elgin were also forced to make changes with Rabin Omar and Daryl McHardy both suspended. Tommy Muir celebrates his second goal of the game. Annan started the match positively with their attack minded team taking the game to Elgin City but despite their obvious territorial advantage Annan had only a 41st minute goal to show for their efforts. Elgin will no doubt look back on the match as an opportunity lost after Shane Sutherland failed to score from the penalty spot in the 51st minute after Steven Swinglehurst was adjudged to have fouled Chris McLeish. Mitchell pulled off a good double save to deny the prolific goal scorer. This was followed up in the 60th minute when Chris McLeish was sent off for a second yellow following a bad foul on Swinglehurst. Annan however fully deserved to win this game as they controlled the vast majority of the game. Elgin City’s scoring opportunities were limited to a 25th minute Shane Sutherland effort which tested Mitchell who tipped the ball over the bar. Elgin keeper Kyle Gourlay on the other hand was an inspiration to his team pulling off several important saves to keep his team in with a chance of lifting something from the game until Tommy Muir secured the match in the 86th minute when he latched on to a Scott Hooper through ball to score with a superb low shot from the edge of the box which beat keeper Gourlay. 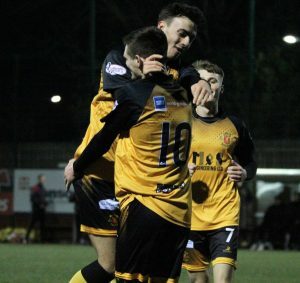 Annan opened the scoring in the 41st minute when Tommy Muir rose above the challenge of David Wilson to send a deft header from a Ryan Sinnamon cross into the corner of the net. This was the only goal which separated the teams in the first half . The second half started well for the visitors when they were awarded the penalty but it all went downhill for them following the dismissal of McLeish with Annan being the team who created the chances with Gourlay pulling off important saves to deny a 25 yard effort from Kyle Bradley in the 68th minute. This was followed up minutes later by a fine save to deny Tommy Muir who connected with a Ross Ferguson cross. The keeper then pulled off another good save from a Swinglehurst header. + 1 min ), Tommy Muir , Ross Fergusson ( Max Wright 90 min . Subs not used Jonny Jamieson GK, Peter Watson. Referee – Steven Kirkland Assistants – Graham McNellie and Ryan Oliver. It was a day when the pace setters Peterhead and Edinburgh City both slipped up with Peterhead going down 2-1 to Clyde and Stirling Albion defeating Edinburgh City 1-0. Albion Rovers and Queens Park had to be content with a share of the points in a 2-2 draw at Hampden Park . Cowdenbeath defeated Berwick Rangers 2-0 to keep their hopes of a play off place alive.